The Dixie Iron Riders is centered in and around Blount County, Tennessee. They've been around since 2006, and are sanctioned by the Tennessee Confederation of Clubs. We emphasize and promote the positive image of motorcyclist as responsible, civil mined role models. We focus on giving back to various communities through charitable endeavors. 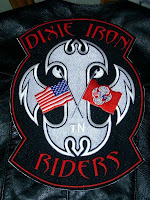 As a member of the Dixie Iron Riders our individual and collective goal is the promotion of our group as one of the premier riding organizations in East Tennessee. Our goal is to reach out to the motorcycle community, as well as the non riding community to promote the love of the motorcycle.